McEwen discussed some intriguing observations by HiRise, which suggest that briny water may flow down steep Martian slopes during the local spring and summer. Sixteen such sites have been identified to date, mostly on the slopes of the huge Valles Marineris canyon complex, McEwen said. The tracks seem to repeat seasonally as the syrupy fluids descend along weather-worn pathways. While the brines may originate underground, Caltech's Edwin Kite noted, there is an increasing suspicion that a process known as deliquescence — in which moisture present in the atmosphere is gathered by compounds on the ground, allowing it to become a liquid — may be responsible. Astrobiologists are keen to learn more about these brines, for not much is known about them at the moment. "Briny water on Mars may or may not be habitable to microbes, either from Earth or from Mars," McEwen said. Martian life may be able to survive even in places where water doesn't seep and flow, some scientists stressed. For example, microbes here on Earth make a living in the Atacama and the dry valleys of Antarctica, both of which are extremely cold and arid, said Chris McKay of NASA's Ames Research Center in Moffett Field, Calif.
Antarctic sites also receive seasonally high ultraviolet radiation doses thanks to a hole in the ozone layer that tends to develop every August through November. This provides yet another parallel to Mars, whose thin atmosphere and lack of a protective magnetic field make the planet more radiation-bombarded than Earth. In the Antarctic dry valleys, McKay said, organisms dwell within rocks, just deep enough to be shielded from the worst of the UV but close enough to the surface to receive the benefits of photosynthesis. Something similar might be happening on Mars today, if life ever evolved there. McKay also discussed deliquescence, which in the Atacama allows salts to gather enough water to support the existence of life. McKay offered some advice to NASA's Mars rover Curiosity, which landed in August to determine whether Mars could ever have supported microbial life: "Watch for salt along the road!" NASA's Curiosity rover found evidence for an ancient, flowing stream on Mars at a few sites, including the rock outcrop pictured here, which the science team has named "Hottah" after Hottah Lake in Canada's Northwest Territories. This image mosaic was taken by Curiosity's 100-millimeter Mastcam telephoto lens on its 39th Martian day, or sol, of the mission (Sept. 14, 2012 PDT/Sept. 15 GMT). A number of presenters spent some time talking about perchlorate, a chlorine-containing chemical that NASA's Phoenix lander spotted near the Martian north pole in 2008. McKay and other researchers think perchlorate may be the reason that NASA's twin Viking landers didn't detect any organic compounds — the carbon-containing building blocks of life as we know it — on the Red Planet back in the 1970s. The Vikings vaporized Martian soil and looked for any organics boiling off. They found nothing but a few chlorine compounds that were attributed to contamination. But after Phoenix's perchlorate find, McKay and some other researchers performed an experiment. They added perchlorate to some desert dirt from Chile known to contain organics. They heated the soil up and found the same chlorine compounds the Vikings did, suggesting that organics may have been present in the Vikings' samples but were broken down by the combination of heat and perchlorate. While this backstory is interesting in its own right, perchlorate is also relevant to the possible habitability of present-day Mars. "Perchlorate, it turns out, is a potent chemoautotrophic energy source," said Carol Stoker, also of NASA Ames, noting that the chemical could potentially sustain microbes in the dark Martian subsurface, where photosynthesis is not an option. And some Earth microbes use perchlorate for food, so that could be happening on Mars as well, scientists have pointed out. 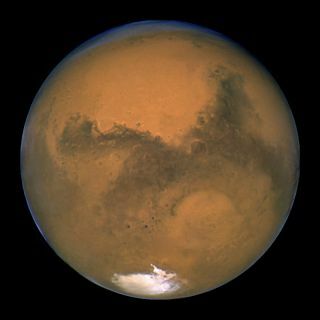 "The Present-Day Habitability of Mars" took place Feb. 4-5 and was co-hosted by the NASA Astrobiology institute and the UK Centre for Astrobiology. Archived videos of conference presentations are available here.